Siemens has brought a tablet PC onto the market for the first time. The Simatic ITP1000 has a projective-capacitive 10” Multitouch display, the latest Intel Core i5 Skylake processor technology and the Trusted Platform Module. 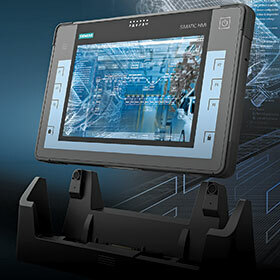 Designed for industrial use, the tablet is especially suitable for service, production, measuring and testing, as well as for operator control and monitoring. It supports Windows 7 and Windows 10 and with many different interfaces and well thought out product features it can be integrated in both new and existing plants. To handle challenging tasks, a high-performance chip set with the latest Intel Skylake CPU technology is used and the DDR4 RAM can be upgraded up to 16 gigabytes, while a 256 or 512-gigabyte SSD (solid state drive) can also be added to the device. Even customised automation tasks can be handled flexibly with the practical industrial functions such as RFID, a bar code reader, camera and six freely programmable function buttons. This is also supported by a wide range of interfaces – such as Bluetooth, WAN, 1-gigabit LAN, serial RS-232 DC-in, miniDP, SD card slot, 1 USB type C and 2 USB 3.0 ports. The PC has an integrated TPM 2.0 module to protect the system and data, and a Kensington lock to prevent theft. An optional docking station with a port replicator that has been designed for practical one-hand docking enables a complete workstation with an external monitor. Typical service applications for the Simatic ITP1000 are instructional films for simple maintenance tasks, location-related service information, and remote access to plants.